I play the Nike vapor pro irons. The irons give me maximum stability,speed and work ability with a piercing trajectory. My 6 iron is the vapor pro fly. I love this club, it gives me forgiveness and distance in a tour-preferred profile. It gives me higher and longer approach shots. 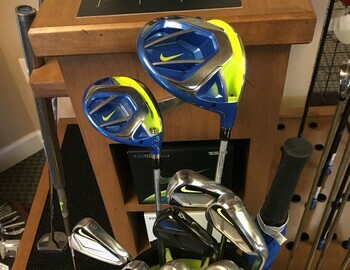 Nike vapor pro driver and 3 wood. The driver is extremely thin and light crown moves weight down for a higher launch and less spin. For me it gives me maximum forgiveness as the same with the 3 wood. Nike engage wedges, dual sole. Gives me a feeling of comfortable with any shots with any lies. Has a heavy feeling that I love. Nike origin b1-01 putter. It has such a soft feel and gives me a faster roll. Rzn black tour balls. Around the greens it gives me a nice spin and stop and check when needed. Off the driver it has a nice sound and goes far. The Nike hybrid bag I use is simply the best. For walking or riding it is light weighted and has many pockets for balls,globes and drinks. I feel with what I have it gives me the tools I need to shoot a good score and gives me the confidence.